For the very first time on The Wood Whisperer, we are going to build a full piece of furniture. 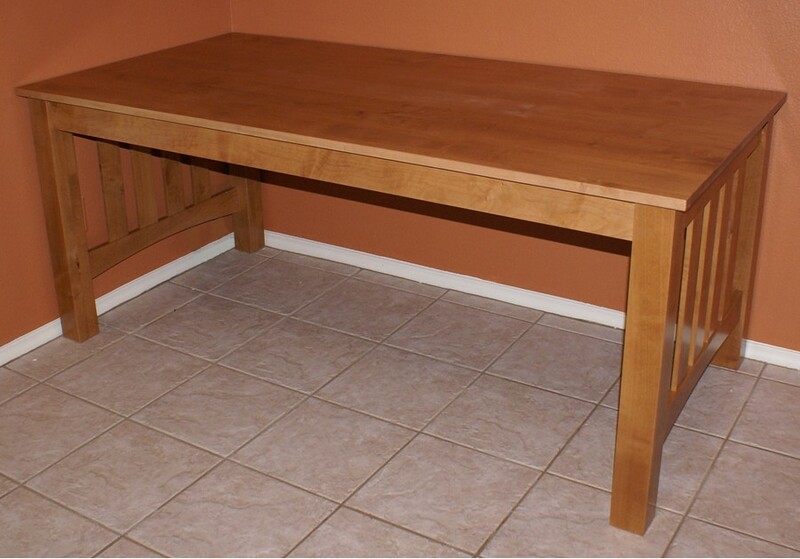 I had a commission recently for a beautiful Arts & Crafts table made of alder. Only problem was, I needed to get it done quickly. And unfortunately, trying to film a podcast at the same time would prove detrimental to my promised time-frame. But since I felt this was a great project for you to see, I filmed as much as a I could and as fast as I could. So if things look a bit rushed or not as polished as usual, cut me a little slack. Note: I will be using the Festool Domino to construct this entire project. If you plan on cutting traditional integral tenons for this project, please include 3″ extra length on all apron pieces for 1 1/2″ tenons, and 2″ extra length on all side slats for 1″ tenons. In part 1 of this episode, I show you the process that I go through whenever I begin a new project. This involves some educated guesses and the use of SketchUp, a free program that allows you to easily draw 3D renderings. Once again a great show Marc. I am a recent Sketchup convert and while I have been using it mainly for house designing it was good to see it in this application. You’re not thinking of making me totally jealous by using some Festool Domino-looking thing for your loose tenon joinery, are you? Going through the project from concept to completed table is a great idea. Looking forward to seeing the rest of it! I’ll also give SketchUp a looksee. I’ve been meaning to check into a 3-D modeling tool for some time, and if this isn’t motivation enough, I don’t know what is. I just downloaded it and gave it a test drive, pretty simple and easy to use and the docs are well done. BTW to copy a component use the “Move” tool. Select the Move tool and hit your Ctrl key (or the Mac equivalent for Marc ;D) and you will notice a small + sign appear next to your Move mouse pointer. This means you are in copy mode. Also you can type in dimensions to create a copy and automatically move it X inches over for automatic spacing. 2. Hit Ctrl to enter copy mode. 3. Select the component and drag it in the direction you want to place it (keep the mouse button down). 4. Type in the number of inches to move it and hit enter. It will automatically create a copy and move it that number of inches in the direction you desire. Really handy for creating multiple evenly spaced components. Thanks for the sketchup primer. (and for fixing whatever it was that seemed to turn the comment window into a clickable link to the above project photo – bizzarre). Going to enjoy the start to finish on this project. Glad your trying to make a show of it too! Your pain is our gain! Thanks for thinking of us!… Oh, and no need to apologise, looks good (apart from, what was that, a plane flying overhead ;) consider the slack, cut. Loved this concept, can’t wait to see the rest of the videos! Do you plan on discussing the business end of the deal at all, talking about what the cost of the project was vs. what your commission was for the project? I would be very interested in something like that. Also check out the Sketchup Demo project written by David Richards. It is a great tutorial on using Sketchup to create an armoire. Hi Mark, I have really enjoyed your videos and have been learning a lot as a result. I just thought I would mention to all potential Sketchup users that the free download version is for non-commercial use. I know that most people don’t read licenses, thus why I mentioned this. If you are using Sketchup for commerical gain, it wouldn’t hurt to pay the small licensing charge associated with the professional version which can be used for commercial gain. This is the first time that i have checked out your site and i’m really amazed how easy you seem to make it all look. This site is going to help me alot with all of my projects and give me the know how of doing them correctly.I am going to check out that goole sketchup. You made it look very simple to created any project.You have a new fan of this site and hope to learn plenty and maybe even help someone else who might need an answer with their project. Marc, I have a Macbook and the free version of SketchUp. Are you using the Pro version (I believe it is SketchUp Pro 7)? I am asking because yesterday I was trying to follow along with this podcast and do some basic designing and some of the buttons you were referring to I couldn’t find, unless you’re calling them something different or are using a different version of SketchUp. Also, what I was seeing on my screen and what I was seeing on your screen did look different. Hey Frank. If you notice the date of this video, it was Feb 2007. I honestly don’t even remember what version of Sketchup we were on at that time. It definitely wasn’t 7 though. The interface has changed quite a bit on the newer versions but they basic tools are still the same. Now I don’t really use the proper names for most of those tools, so don’t trust what I call them. But functionally, those buttons should still exist in the Sketchup interface. You might need to play with the toolbar so that you have the buttons you need there for convenience. You mean February 2007 dontcha? I’m going to follow along with Aaron Marshall to see how he does things, and just play around with it some more, even though he was using a PC (oh, the horror!). Sometimes I get too easily frustrated and I just need to stick it out. Thanks. Okay, now you have me second guessing myself, but I see now that you cheated because this is your site and you can do what you want. lol. I am like the Great Oz here Frank. Just a little guy behind a big curtain. View -> Tool Palettes -> Large Tool Set. This took me forever to figure out when I started learning Sketchup about a year ago. I also strongly recommend going through the Sketchup video tutorials and getting familiar with making components. I use components now like crazy. Case in point: I’ll make a leg, then also make the mortise, slots, bevels, round overs, etc. etc. Then I simply propagate that component out throughout my project. In two seconds your sketch up will go from looking crude to looking amazing. Great Video! I’m a draftsmen by day and use AutoCad all the time. I was stuck with where some of the commands where in Sktchup, and you just showed them to me. Thanks Marc. It took me to another level with sketchup written by a fellow woodworker. Takes you thru a set of projects from simple to advanced. Marc, I want to thank you for posting this video. I have always been intimidated by Sketch up, but have wanted to use it. The tutorials are very time consuming and not very helpful. After watching yours, while going back and forth to Sketch up, I figured the basics out. I’m getting better everyday..
Maybe a newer, updated video with your enhanced use/skill of Sketch up could help others?